Thymus - Hyperplasia, Epithelial in a male B6C3F1 mouse from a chronic study. 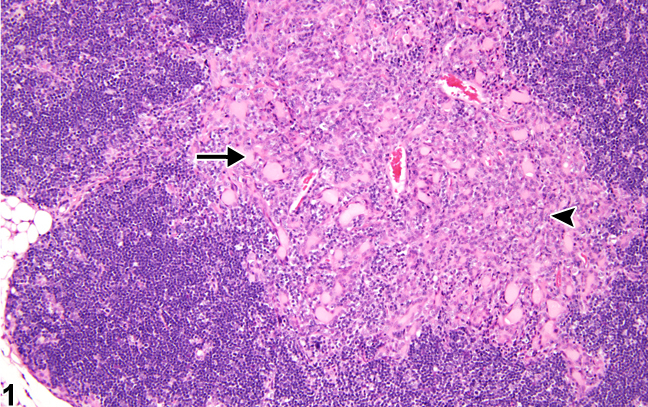 Hyperplastic epithelial cells form tubules (arrow) and cords (arrowhead) within the thymus medulla. 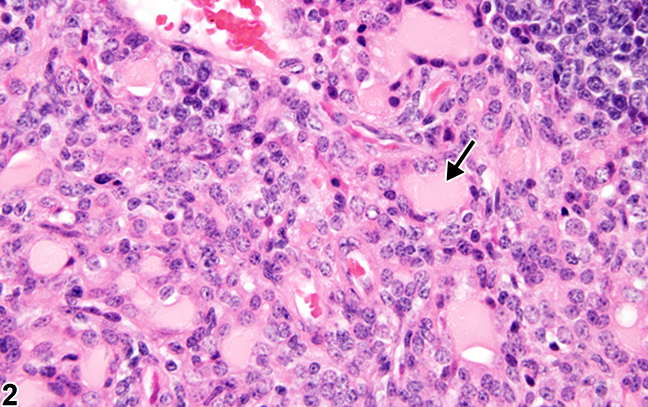 Thymus - Hyperplasia, Epithelial (higher magnification of Figure 1). 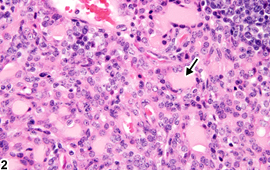 Tubules formed by hyperplastic epithelial cells contain eosinophilic secretory material (arrow). Epithelial hyperplasia is often associated with involution and/or atrophy of the thymus and may occur at relatively high incidences in some rodent strains. Thymic epithelial hyperplasia is found in the medulla and may be focal to diffuse. Epithelial cells are cuboidal to columnar, have paler-staining abundant cytoplasm, and may be ciliated. They often form tubules ( Figure 1 , arrow), ribbons, or cords ( Figure 1 , arrowhead). 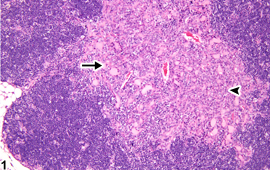 Tubules can contain variable amounts of eosinophilic secretory material ( Figure 2 , arrow). Epithelial changes are more prominent in females than in males and in rats more so than in mice. Pleomorphic variations of thymic epithelial hyperplasia are similar to the spectrum of cellular forms of thymoma. Consequently, thymic epithelial hyperplasia may be difficult to distinguish from early, benign thymomas. However, thymomas are nodular and compressing, whereas hyperplasias are not. Epithelial hyperplasia in the thymus should be diagnosed and graded when not associated with involution. Frith CH, Ward JM, Brown RH, Tyler RD, Chandra M, Stromberg PC. 1996. Proliferative lesions of the hematopoietic and lymphatic systems in rats. HL-1. In: Guides for Toxicologic Pathology. STP/ARP/AFIP, Washington, DC. National Toxicology Program. 1998. NTP TR-477. Toxicology and Carcinogenesis Studies of 1-Chloro-2-Propanol (Technical Grade) (CAS No. 127-00-4) in F344/N Rats and B6C3F1 Mice (Drinking Water Studies). NTP, Research Triangle Park, NC.